While I am pretty good at cooking almost everything, Geoff is the undisputed king of two things at our house: eggs and rice krispy treats. I'm not a huge fan of breakfast foods, but Geoff makes the best eggs I've ever had... scrambled eggs, fried eggs, breakfast sandwiches, they are all delicious. And his rice krispy treats? Totally awesome. Apparently he made them for his family every Sunday when he was growing up, so he's had a lot of practice. We like to come up with new variations (we even tried Trix krispy treats this week) but I think our favorite so far has been these chocolate peanut butter treats. Melt butter in a medium saucepan, and add marshmallows. Stir until marshmallows are melted, then add peanut butter and chocolate chips. 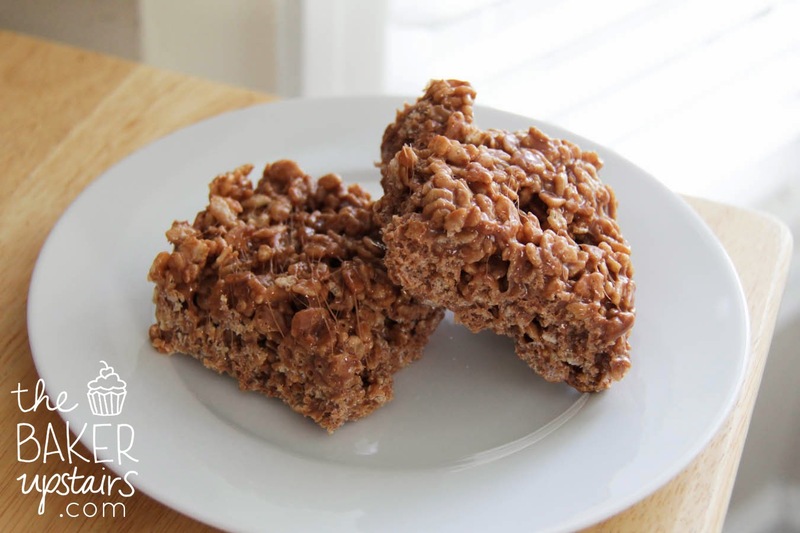 Stir until melted and consistent throughout, then add rice krispies to taste. Press into a 9 x 9 baking dish sprayed with cooking spray and allow to cool. So simple and so delicious!